I’m happy to introduce a new feature on my teaching method and my learning Thai resources to you all. It’s called Thai Proverbs. My students are thrill for this!! 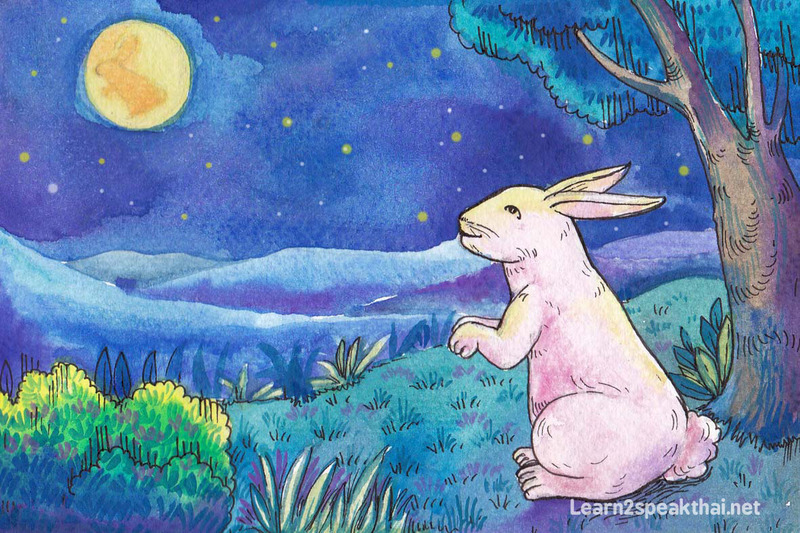 Literal meaning is The rabbit dreams of the moon, the saying is therefore about desiring unattainable goals. Mostly used for a poor man dreaming of a woman who definitely out of his reach. In English, to cry for the moon would give equivalence meaning. For example : The girl he has a crush on is far beyond his ability to even get close to her. She is from much higher background and education. He would be like” grà-dtàai măai jan” rabbit dreams of the moon. This proverb is demonstrated the classes system in Thai culture. A proverb is a well known saying that conveys some kind of moral or lesson. I want to do more than teach you to speak Thai. I want to teach you to appreciate Thai culture. Thai Proverbs is one of the ways I plan teach you the culture of Thai people. There are over 70 proverbs are run in alphabetically order both Thai/English some are now published and some are on the way. In each Thai Proverbs lesson I provide you with a Thai proverb and match it with a similar proverb from the English language. You can then read what each proverb means to Thai people. You also have the opportunity to read the proverb in Thai and listen to the Thai pronunciation. Finally, each of the Thai Proverbs is fully illustrated by a local artist here in Chiang Mai, Thailand. His excellent drawings of typically Thai situations are colorful and interesting. They are also a great aid in learning the Thai proverbs. I hope you will be pleased with this new feature at learn2speakthai.net. Why not try to learn a Thai proverb today? You will be surprise how much you could learn in just one proverb. Don’t forget : learning a new language is not just to speak it BUT also to understand it’s culture and way of life. Ready to see at the proverbs ?? let’s go!!! This entry was posted in Thai Proverb. Bookmark the permalink. Are there somewhere all Thai proverbs in form of PDF? I would like to print them.